I am obsessed with the task of packing lunches. I've written about how I try to keep the kid's lunches waste-free and full of nourishing food. Some days I do better than others. I am so glad a friend pointed me to the company called One Small Step. It was started by a mom who needed to pack waste-free lunches for her child (as per school requirement). She found it surprisingly hard to locate the gear she needed to make that happen. So, like many smart moms she started a company which sells all the elements of a waste free lunch. They have many formats and options. I have my eye on the new, colorful and small kleen kanteens. While the site doesn't support online shopping yet (they take email and phone orders) they give an impressive amount of their profits to charity. 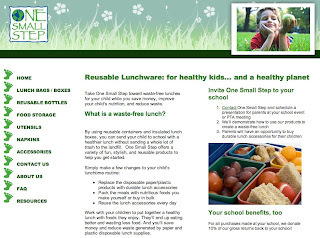 They also are available to make waste-free lunch presentations to local schools. Love that! It is a great resource all-around.